I've been looking for a new makeup bag for ages. My mom found this one for 50-cents. 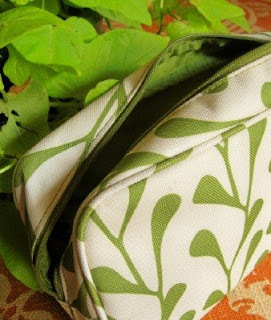 Not only is it just big enough, its organic green pattern looks great with my bathroom colors. Score one for friends and family! Way to go! I think I might actually have an identical bag! Or, it's really similar. I got mine "free" when I bought $25 or whatever at Clinique. It came with some makeup and other bags as well. Since I use Clinique to wash my face, and the soap I bought at that time is still going strong, it works for me! Yep, that's it! It was definitely a free bag, so kudos to the lady who sold it to my mom at a yard sale. Since it had never been used, we still thought it was worth fifty cents...especially after looking at uglier $5 bags at Target. I have this exact bag! How funny to see it posted on your blog. I use mine to hold all my grocery shopping supplies- 2 photo books full of coupons, pen, highlighters, grocery list, calculator, Walgreens Easy Saver catalog, and grocery store circulars. It keeps all of this stuff contained at home and is easy to grab as I head out to the grocery store. Great score! It's a really pretty bag. Oooh, I really like that bag. Lucky you to get one for a bargain that is pretty enough to leave out. Enjoy it! Oh, and thanks to your inspiring blog, I've become a secondhand store shopper. I just got a great green shirt for pennies on the dollar. Yay! You set such a good example here. In the past I had just gone to thrift stores/garage sales for decorative items. Now, I regularly look for things I need. I found an ironing board cover new in the package and bought it for $3. I was feeling that was a bit high for thrift...until I saw the same one at Target for $13! I love green...very pretty! I need a new makeup bag, too. I had a cute French country print one from Target but it finally bit the dust. That bag is gorgeous! I have a black bag that came with my $30 luggage set. Not pretty but hides stains well. Maybe I should try this hue of green. I really like it! Cute bag...and I love the print.